1. Slice the chicken, then make a marinade of red chilli powder, garam masala, turmeric, cumin, coriander, cinnamon, lemon/lime juice, yoghurt, salt and sugar. Mix in the chicken pieces and refrigerate for 2–3 hours. 2. Heat oil in a pan and sauté onions until translucent, then grind into a paste when cooled. 3. Heat 3 tsp of butter in pan, add cardamom and sauté for 1 minute. 4. Add grated ginger, crushed garlic, onion paste and sauté for 3–4 minutes. 5. Add marinated chicken and fry for 7–8 minutes. 6. Add crushed tomato and cup of water and bring to boil, until the chicken is tender. 7. 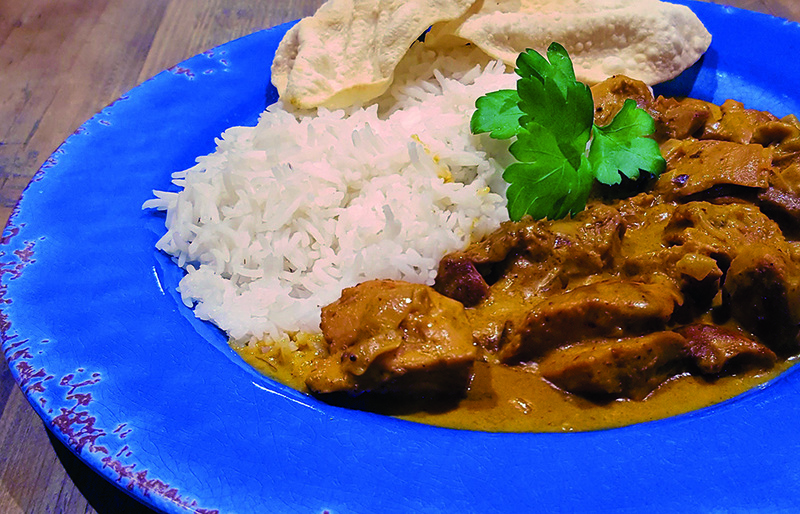 Add 1 tsp of butter and the cream to the chicken and mix well, then serve with rice, chapatti or nan.